This building is not really a castle, it is a fortified and crenellated house. In 1284, Robert Burnell, Lord Chancellor to Edward I and Bishop of Bath and Wells, obtained a licence to crenellate the family home, and to take timber from the royal forests for the purpose. The result was this house with its four defensive towers, an embattled roof, but no moat. 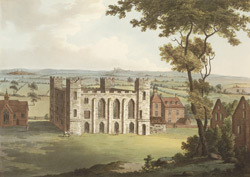 Also visible in the print are a long stone barn to the east of the castle and the Church of St Mary at nearby Acton Burnell.